This year has continued the tradition of the last several years with good months followed by a not so good month. February was a great month for sales and March was not. 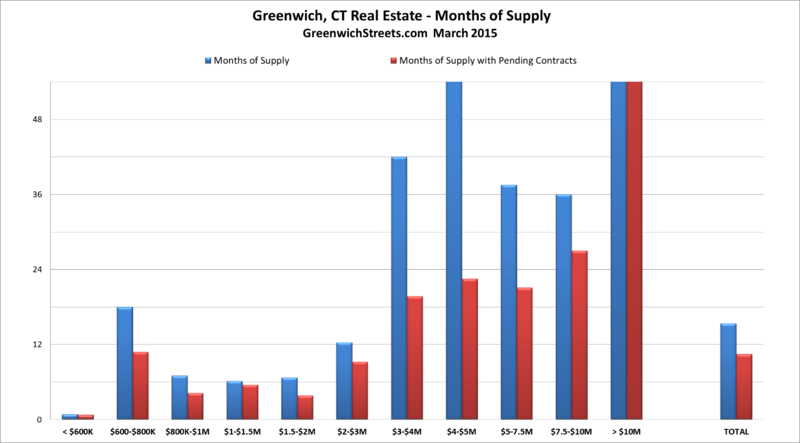 Last month, 41 houses sold in Greenwich. This month, we are down to 31 houses sales as reported by the GMLS. We’ll pick up a few more private sales, but I’ll be very surprised if get to our 9 year average of 42 sales in March. Our inventory continues to be low with only 461 total houses on the market in all of Greenwich. Under $3 million, we are down 41 listings over this time last year to only 109 listings. (Under $600K we only have 3 house listings.) This shortage of inventory in our most active markets is disguised by the increase of listings in 2015 from $3 – $5 million where we are up 32 listings over 2014. Our mid-market from $1 to $3M continues to be the hot part of the market. Of our 90 sales so far this year 57 are between $1 and $3 million. We also have 20 contracts between $1.5 million and $3 million so this price category will have good sales this month also. When you look at the rest of the market we are down 9 contracts. One noticeable bright spot is the $5 – 7.5M price range where we are up 7 contracts over last year. If you look at the months of supply sales curve (blue bars) you can see what a harsh winter we have had in the first quarter. The month of supply sales bars are all over the place as a few sales either way in each price category resulted in significant moves up and down. If you add in the contracts (red bars) you can see that you have a much smoother curve from the low end to the high end. (The one major exception is the $600K to $800K where we only have 11 listings and two sales so far this years, but we have 3 properties under contract in this price range.) You can see the effect of the harsh winter if you look at the $3 – $10M price range. If you compare the height of the sales bar (blue bars) to the height of sales and contracts bar (red bar) you can see how much the contracts in this price range will be improving as a result of post-snow contracts. To see just how competitive the $1 – $2 million market is stack the red bar (contracts) on top of the light blue bar (sales) and compare their combined height to the dark blue bar inventory. You can see just how competitive this part of the market is. If you do the same thing over $3 million you can see that we have a higher percentage of inventory and fewer sales and contracts. The nice thing is that the red bars in these price ranges are all taller than the light blue bars showing that this segment is improving. The cumulative effects of bad weather in January, February and the early part of March drove sales down in March 2015. The last two years, March sales have lagged compared to the average only to see a recovery above average in April. The odds are that this pattern will repeat itself in 2015. We have more contracts than last year and the threat of rising interest rates later this year seem to be motivating folks particularly in our middle market. Another way to look at the market is the size of the pie pieces. In 2015 they look much different than in prior years. If you look at the YTD Solds pie you can see how big the $1 – $3 million market is compared to the inventory. You can also see from the contract pie that it will continue strong. The contract pie chart also shows that the $3 – 10 million market will also be getting better. The first quarter shows a very strong mid-market and signs of an improving market over $3 million. The one worrisome area is sales over $10M where we have had only 2 sales so far this year of GMLS listed properties and 2 private sales. The lower end of the market just needs more inventory and sales will do well. Mid-country should stay strong this year and backcountry’s recovery should accelerate. Old Greenwich and Riverside, and particularly SoTra (south of the tracks) will command an even greater premium price. This means that Cos Cob and Glenville will also continue to appreciate as the best combination of square footage, acreage, schools and price for many families priced out of or not willing to pay the SoTra premium. Builders are going to be much more active both for teardowns and custom built houses and for spec houses. In fact, with financing for spec houses finally coming back, the builders could see major growth this year.